Canon caused a little bit of confusion launching the Canon T3 and its more expensive big brother, the T3i at the same time. The Rebel T3 DSLR features a 12.2-megapixel Canon CMOS image sensor, coupled with a DIGIC 4 Imaging Processor. As it turned out it was a good move for Canon because both of the these cameras have been best sellers as well as have achieved high customer feedback. The T3i gives you a bit more bang for a few more bucks. 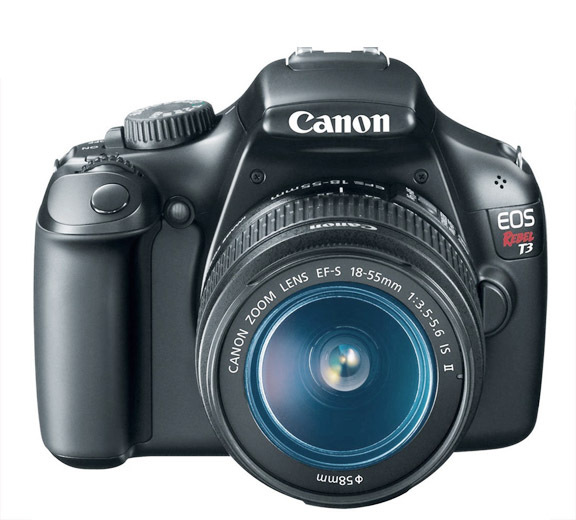 The T3i has 18.0 megapixels and more features but the Canon T3 is extremely popular and affordable. 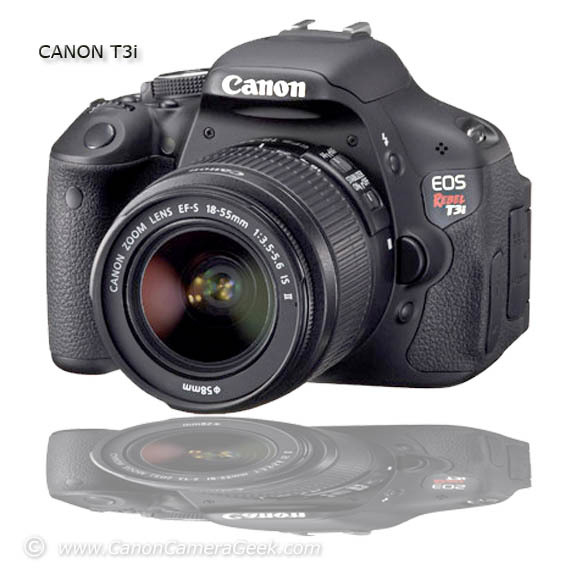 This Canon camera review will focus on both the T3 and T3i. It has been suggested that Canon designed the T3 for first time buyers of digital SLRs and not serious photography hobbyists. I believe this camera may be appealing to both groups. It is definitely marketed toward photographers looking to buy an entry level camera and save money at the same time. Just take a good long look at the T3i camera photo above. The T3 camera has an average, more budget grip. The T3i has a more professional feel with its grip. You automatically feel like a professional photographer when you have either one of these Canon cameras in your hands. 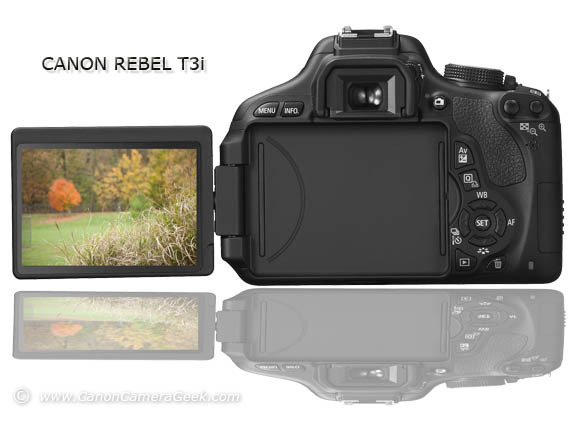 The Rebel T3i was designed to include several features with the beginner in mind as well. 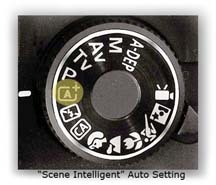 One of the cool components is a "feature guide" that gives you an explanation of camera functions right on the LCD. The "Scene Intelligent Mode" takes some of the brain work away from you for guessing what exposure mode to use. The camera analyzes the scene in front of the you and it selects the camera settings that its "brain" thinks will take the best picture..
You can also use the "Creative Filters" to create some cool after-exposure effects such as a fake-miniature look, the fish-eye effect and toy camera. The pixels in the Rebel T3 are about 10 times larger than a cheapo point and shoot camera. Simply put, that means better quality in low light situations. If you read the technical reviews by professional reviewers on Canon camera review web sites the T3 does extremely well with low noise. One of the coolest features for me personally is the mulit-angle, rotating LCD screen pictured below. That is also one of my favorite features with Canon's premium compact cameras like the g12, g15 and g1X. The flip-out Vari-angle 3.0-inch Clear View LCD monitor is great for shooting at a variety of angles. Rotate the monitor and you can hold the camera high overhead for shooting above the crowd. You can also use the camera down low for photographing your rug-rats or your favorite pet. Want to shoot a self portrait? The Canon T3i's LCD screen can be turned 180 degrees. You can use it to take your own Facebook photo. The Canon Rebel T3 features an ISO range from 100-6400 and its big brother, the T3i goes up to 12,800 ISO. The Rebel T3i can also capture full HD video (30p-24p-25p), HD (60p-50p) and SD video (30p-25p). Here's the skinny on shooting video with the Canon Rebel T3. I recommend getting an image stabilizer (IS) version of a Canon lens. A NON-stabilized lens will give you a lot more camera shake which is very distracting when viewing video. You can still get that professional cinema quality with limited depth of field because the T3 does have a big sensor. One of the strong points of the T3 is that it's still part of the Canon Rebel line of cameras and take all of the Canon Rebel Accessories, including the not-made-by-Canon Canon BG-E10 Battery Grip. Canon EOS Utility 2.10.0 - Transfer images either automatically or manually by using WIA. you can also adjust camera settings with remote 'tethered' shooting. Canon ZoomBrowser EX 6.7 - Easy to use image browsing and organization with a unique interface. Includes simple image editing and very basic video editing, email and printing. Canon Digital Photo Professional 3.10.0.0 - Raw file conversion along with a bunch of adjustment options and different outputs. Canon PhotoStitch 3.1 - A utility for stitching panoramic photographs. Picture Style Editor 1.9.0 - Create custom Picture Styles. I do have one complaint about Canon cameras and that is their naming system. Many of the other digital camera manufacturers are guilty of this as well. It's not a big deal, but it can be confusing to camera shoppers when you search for a particular Canon camera. Is it the Canon EOS 600D (EOS Rebel T3i / EOS Kiss X5) or the Canon 1100D (EOS Rebel T3 / EOS Kiss X50)? I understand from Canon's viewpoint, it's done for marketing purposes. Canon Camera buyers just need to make sure their country's warranty is the right one and that voltages for batteries or charging are correct too. The Canon Rebel t3 was a leader in its time. It's still worth buying for a brand new photographer, particularly if you consider buying a used one to experiment with. My new favorite Canon DSLR is the EOS 70D. I like it so much that it's become my Take Anywhere Camera. Great image quality for a APS-C sensor-same size as the Canon t3 sensor. The dual pixel focusing technology it has makes a huge difference. That plus the 19 cross-type of focusing points improves speed AND accuracy. The price of the 70D is coming down with the arrival of the new Canon EOS 80D. I was hesitant to buy one, but once I got it into my hands, there was no way I was going to send it back. Here's more on my 70D.